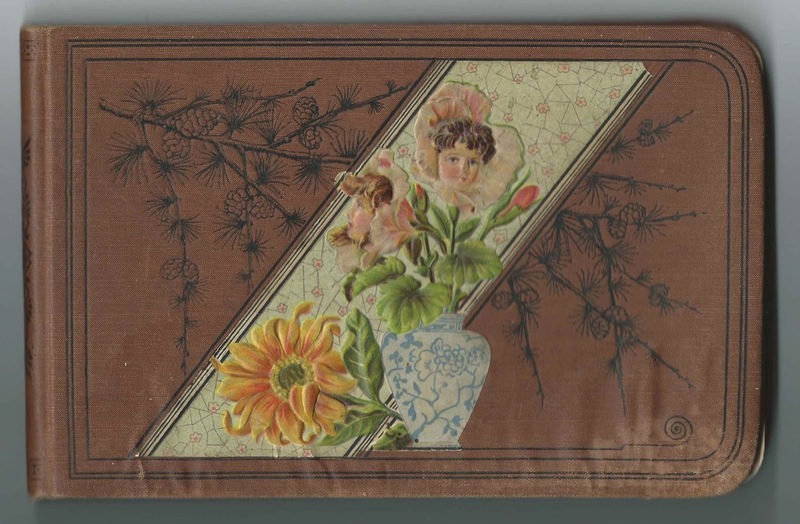 1880s autograph album that belonged to Bertram Felmore Reimold of Saginaw, Michigan. He wrote his name on the inside front cover, which also includes a newspaper clipping in German. 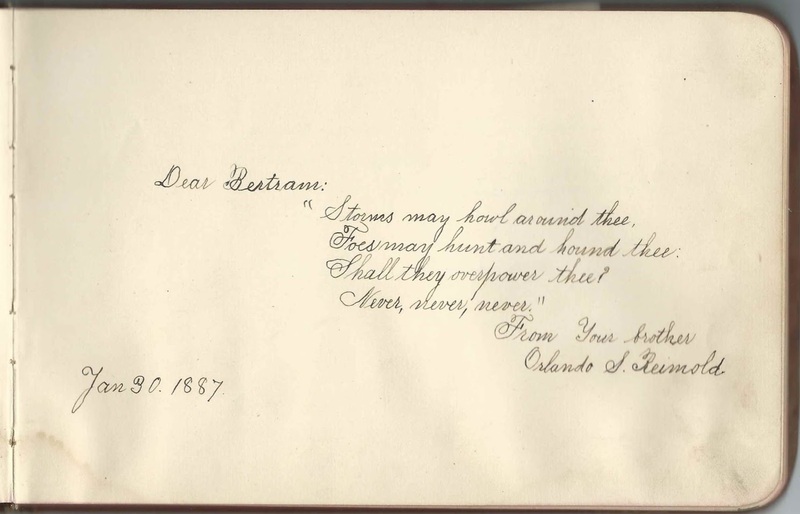 The album measures approximately 7-3/4" x 5" and contains the sentiments of 32 of Bertram's relatives, friends and schoolmates. An alphabetical surname list and an alphabetical list of the signers, together with any personal information they offered, appear at the end of this post. Bertram Felmore Reimold was born September 6, 1875 at Saginaw, Michigan, the son of Johann Christian Reimold and Louisa Henriette (Schairer) Reimold. 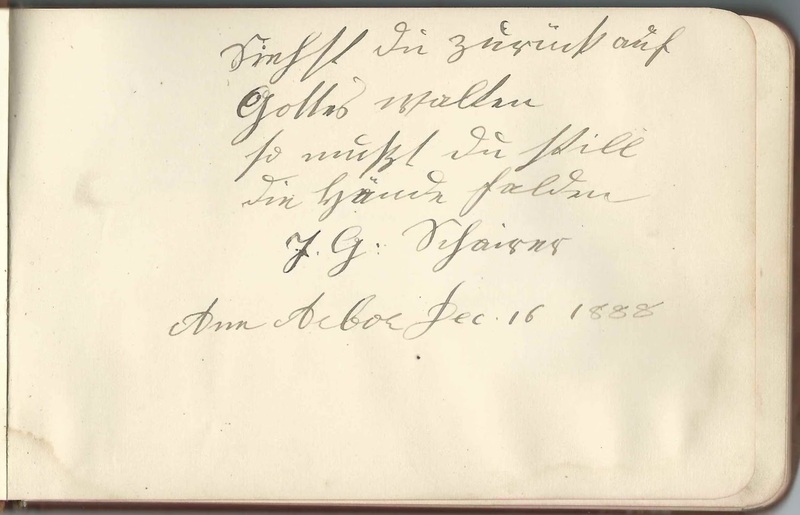 Bertram's father may have signed one of the pages written in German that I had a hard time deciphering the name of the inscriber, let alone the message. Bertram's maternal grandmother, Christiana Magdalene (Ruhle) Schairer, signed a page at Ann Arbor, Michigan, on December 16, 1888. The name that I first thought was F. G. Schairer might instead be J. G. Schairer. If so, the signer may have been Bertram's maternal grandfather, Johann George Schairer, husband of Christiana. 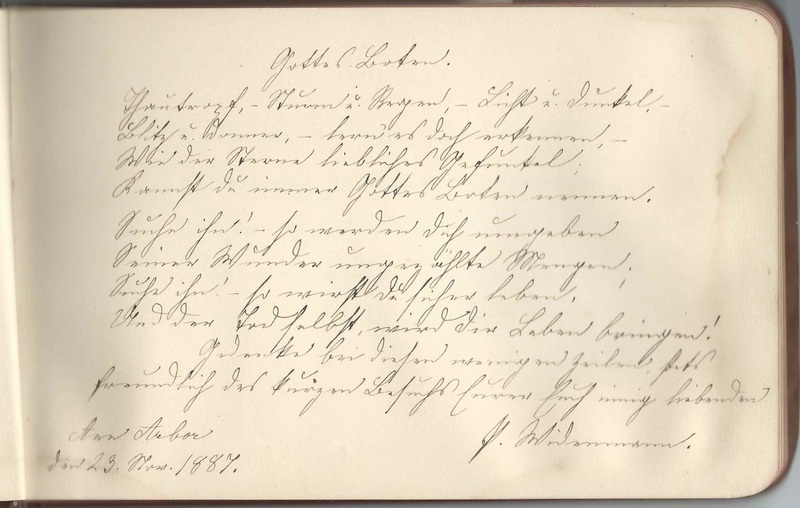 Bertram had, I think, nine siblings, the eldest of whom, Orlando Schairer Reimold, inscribed a page on January 30, 1887. Several other relatives from the Schairer side of the family signed pages in the album, including the Shairer, Otto and Krause families. Refer to the list below. On August 7, 1918 at St. Joseph, Indiana, Bertram Felmore Reimold married Coral F. (Genrow) Seaton, daughter of Joseph and Ruth (Ellsworth) Genrow. Coral had two children from a previous marriage to James H. Seaton, whom she had divorced earlier in 1918. By 1920, the new family had moved to Cleveland, Ohio. If Coral and Bertram had children of their own, I didn't find evidence of them. Bertram died in 1968. The album contains three items tucked inside: the calling card of Jose. 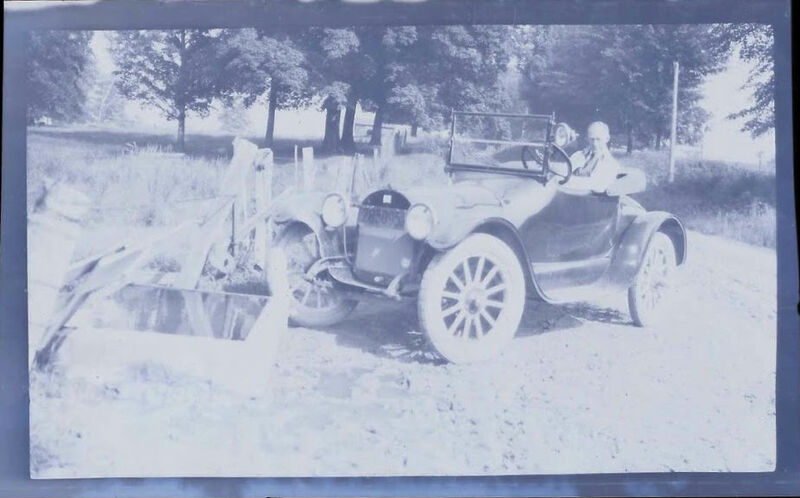 F. Badaracco; a negative photograph of a middle-aged man at the wheel of an automobile; and a clipping describing one of Bertram's exploits. I've inverted the image to show you the photograph. In the event that a reader might volunteer to translate some of the pages written in German and leave a comment, I'm including them below. The page below was signed, I believe, by Rev. Karl Lemster, father of one or more of the signers. 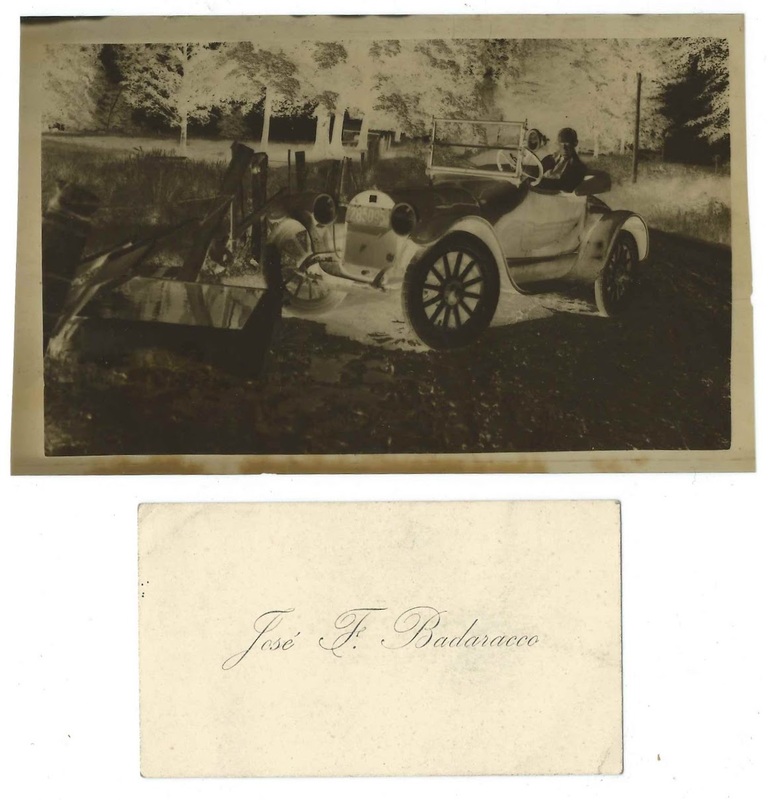 Jose F. Badaracco; his calling card tucked in the album in the same place as a photograph of a man in a period automobile, who may or may not be Mr. Badaracco. Jose may have been Joseph. "Your Uncle" Samuel Krause of Ann Arbor, Michigan, signed on January 11, 1889. He was married to Emma Christine (Schairer) Krause, sister of Bertram's mother Louise Henriette (Schairer) Reimold. H. Lemster, signed at Tittabawassee, Michigan, on January 15, 1887. Message in German. Perhaps Heinrich C. Lemster, son of Rev. Karl Lemster. Karl Lemster, signed at Tittabawassee, Michigan, on December 27, 1886. Message in German. Presumably Rev. Karl Lemster. 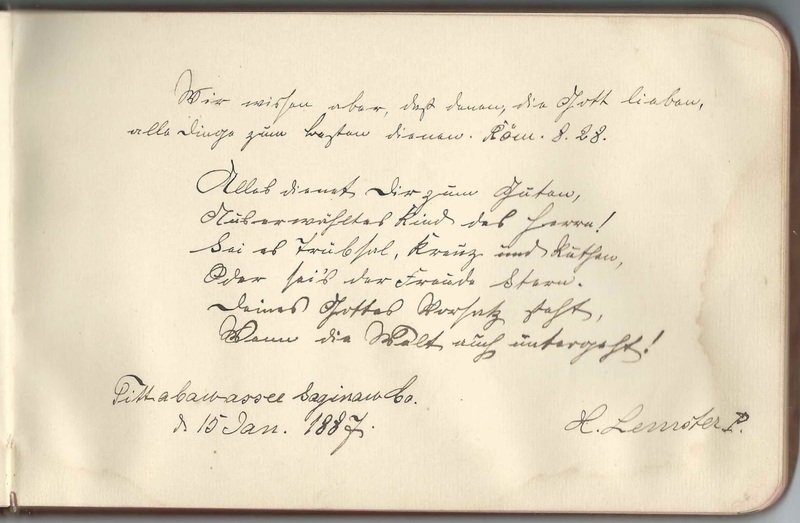 John Lemster, signed at Tittabawassee, Michigan, on February 2, 1887; message in German. Cousin Mattie and Aunt Maria, signed at Ann Arbor, Michigan, on December 16, 1888. Presumably Martha Christine Otto and her mother Marie Magdalene (Schairer) Otto. Orlando S. Reimold, signed on January 30, 1887; "Your brother". He was Orlando Schairer Reimold, older brother of album owner Bertram Felmore Reimold. F. G. Schairer, signed at Ann Arbor, Michigan, on December 16, 1888; not sure of first initial, which could be a J. Message written in German. If the first initial is a J., this could have been Johann Georg Schairer, Bertram's maternal grandfather. 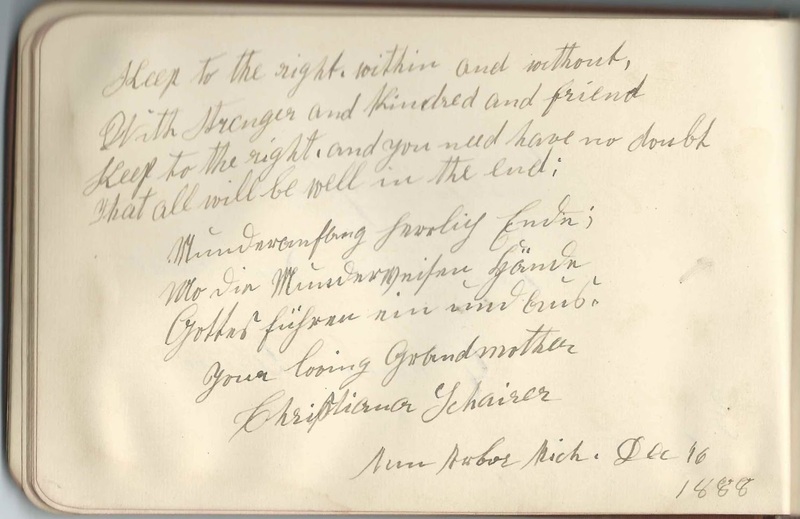 Christiana Schairer, signed at Ann Arbor, Michigan, on December 18, 1888; "Your loving Grandmother". She was Christiana Madalene (Ruhle) Schairer. Aunt Alice, signed at West Point, Nebraska. Presumably Alice Augusta Schairer, younger sister of Bertram's mother Louise Henriette (Schairer) Reimold. She would marry William Huelster in 1903. Uncle Fred and Aunt Mattie Schairer, signed at Ann Arbor, Michigan, on December 6, 1888. They were Daniel Friedrich Schairer and wife Martha Barbara (Good) Schairer. Matilda Wiedermeier, signed at Saginaw, Michigan, on March 14, 1888; "Your Teacher"